Penguin Doctor Who: Time Lord Fairy Tales read by Tom Baker, Paul McGann, Joanna Page, Michelle Gomez, Adjoa Andoh, Ingrid Oliver, Anne Reid, Dan Starkey, Sophie Aldred, Rachael Stirling, Samuel Anderson, Nicholas Briggs, Pippa Bennett-Warner, Yasmin Paige & Andrew Brooke. 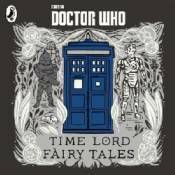 A collection of dark and ancient fairy tales from the world of Doctor Who, these captivating stories include mysterious myths and legends about heroes and monsters of all kinds, from every corner of the universe. Originally told to young Time Lords at bedtime, these twisted tales are enchanting for Doctor Who fans of all ages.